On a grey, not very special evening weather wise, around 18 members met in Thornton-le-Dale near Pickering for a visit to Mathewson’s. 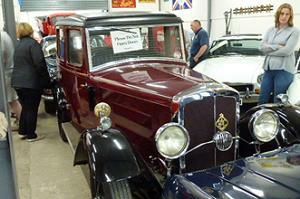 In addition to renovating, repairing and selling classic cars Mathewson's hold 7 auctions a year. Our visit was timed for 3 days before an auction so there would be plenty of vehicles to be seen. We were not disappointed! 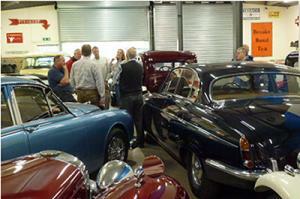 Mathewson's used to have a museum full of classic cars but have given this up to concentrate on the auctions. However, there is still a lot of memorabilia in the buildings – old signs, pumps, tools, manuals and the like. They have plans to erect new buildings and reorganise the site so classic car auctions are obviously big business. We were hosted by Derek Mathewson. 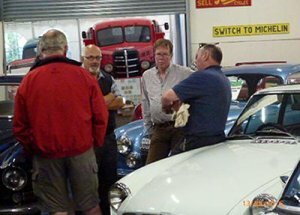 There was no formal structure to the visit – it was basically wander round, ogle / lust over / discount vehicles as the case may be and ask plenty of questions. Derek was a mine of information, knew all about the cars going to auction and reeled off auction price estimates without hesitation. I think he would have chatted all night given the chance! 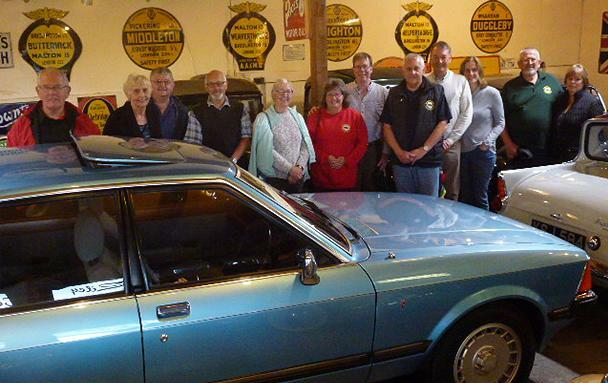 There was a very varied selection of vehicles – Mini Cooper, Mini Countryman, a couple of Jags, two Bs, a Midget, a Riley, a tractor, a Bedford lorry, assorted motor bikes, 105E Anglia and a Ferrari previously owned by Pete Waterman (estimate £50k +) to name but a few. 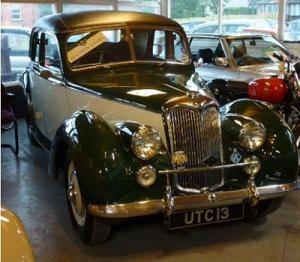 For many people the star turn was the Riley (see photo) – don’t recall model / age but auction estimate was £12k to £14k. Looked like a bargain at that price. There was a bit of rain during the visit but that was not a problem as we were under cover. However, just as we were leaving the heavens opened and there was a monsoon-like thunderstorm that turned the road into a river and had us sheltering under Mathewson's canopy. I think some members took solace in the local hostelry; others forgot their diets and sought out the chippy. The rain did stop but I was extremely glad I hadn’t taken our roadster – it would have been rather damp inside!